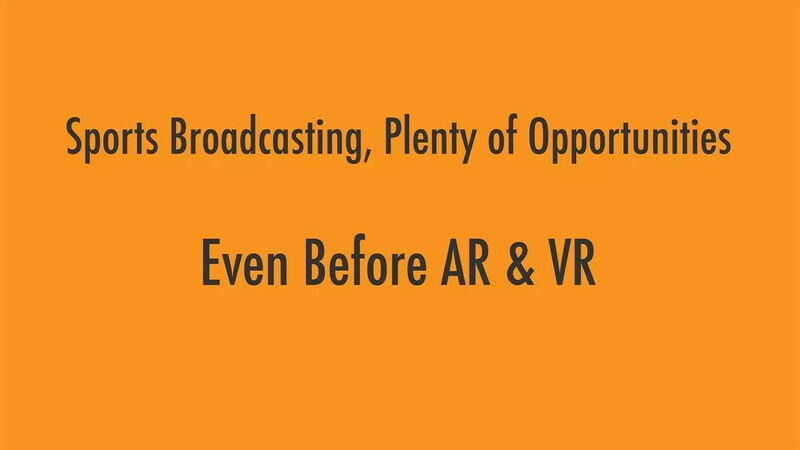 Before we bring AR and VR to Sports broadcasting, let’s take a look at how it can benefit from other technologies that are available NOW! Due to technological advances, we have already seen how Millennials and Generation Z are impacting society and consumer habits. In the US alone, PayTV subscriptions are continuously declining while streaming platforms grow in popularity, which can show that most every-day tasks are all slowly turning to digital solutions. So how can we pull the younger generations into sports entertainment? By utilizing the various methods within technology to foster Immersions-experience within sports, which I will highlight below. First, let’s start with haptics. Sports viewing is full of excitement both on- and off-field; from a cacophony of sounds in the crowds to impacts and movement of the players, Haptics data can simulate the event, creating a heightened experience to viewers. In fact, and thanks to Guitammer, Haptics data are taken from sporting events can be transmitted to consumer devices, and video streaming platforms like Facebook and YouTube. Seeing and hearing the game is excellent, feeling it is even more immersive. This is evident in Guitammer’s—an Ohio-based, haptics technology and products specialized company—success with the “BUTTKICKER” in cinema. Placed under the seat, the “BUTTKICKER”’s shakes in-sync with the movie action, which causes the viewer to feel as if he or she were in the movie. Guitammer furthered this technology by developing an end to end platform that allows producers to capture Haptics data in real time using sensors that can be attached to players or objects, and deliver the data within the existing broadcast stream. In the near future, and with AI technologies, they will be able to generate Haptics from visual action as well. The second opportunity within the sporting world is through the brilliant New York start-up “neo360”. The “neo360” experience gives the fan the pleasure of interacting with videos like never before. Their patent-pending technologies grant mobile users the complete control of speed, direction, and frame of both low frame-rate and high-frame-rate videos. Neo360 is focusing on VR. However, the experience is also applicable on HD or even 4K. Through this, fans no longer need to wait for the sports broadcaster to replay a play, but rather, through a certain hand motion can alter the angels and play back the exact moment he or she wants to re-watch. Download the App here (I had the opportunity to meet the team behind the neo360 and all I can say is “wait and see.”) Imagine the impact this new technology will have if combined with haptics as well! The third option to be incorporated into sports broadcasting is from another start-up company, Mobsting (Founded by my childhood friend, Fadi Abbas). Although Mobsting does not focus on sports, the technology created by the company can still be applied to industry. Thus far, Mobsting is the most straightforward video capturing, editing, publishing, and sharing tool I’ve seen. Its easy to use platform allows users to capture a video, invite others to contribute to the story, edit and publish the work in real time via their mobile devices—meaning no wait for processing time! Let’s go back to the sports world, can you imagine the content captured by fans at any given stadium during a game? I can. The Mobsting platform will allow users at the stadium to contribute to one or more video streams. In fact, the stadium’s own video team and even a professional league like the MLB or NFL can take the user-generated-content (UGC) and create videos for their social. And lastly, I will end the blog with what my friends at Neulion announced a couple of weeks ago. The “Virtual announcer” is a cloud-based platform that allows sports broadcasters to bring any announcer or commentator voice from any place in the world and sync it with the live broadcast stream. Yes, Neulion managed to overcome a very complicated technical challenge. The primary use case is targeting broadcasters who want to get the commentator voice without flying him/her to the stadium or their facilities. Now, the commentator can be anywhere and record their voice with an App from their home. The “Virtual Announcer” will allow users and fans also to become “Social Commentators.” From home, you can use the App and stream your voice to your friends, family members, and followers. Perhaps we will even see “regular” folks become famous “Social commentators” as we’ve seen on other social media platforms (The YouTubers). Neulion did not announce the social part, but I assume many sports broadcasters will jump on the opportunity as the technology hurdle is now behind, thanks Neulion! Overall, all these new advances will heighten the sports experience of any avid fan of baseball, soccer, football, etc. If only the Neulion powered App that allows sports viewers to become commentators, the Mobsting platform that will enable fans to shoot, edit and publish stories in real time, the Guitammer haptics that augments any entertainment experience, and the Neo360 video control features all on combined on an outstanding mobile sports experience. YES, Millennials will like that! One last note, all of the above technologies experiences can be applied to today’s standard HD, 4K or even UGC content, as well as on VR. In fact, I am working with some of these startups above to build the bridge between these great brains and the sports industry. Stay tuned for some cool news!